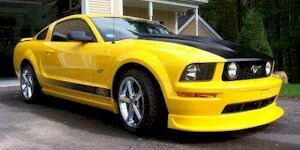 Steeda Autosports offered both performance parts and turn-key cars for the 2005 Mustang model year. Modifications included: unique hood, air dam, and spoiler; bigger diameter Steeda wheel; Billet aluminum throughout; suspension changes; and engine performance upgrades. Models included the V6, GT, and Q. Black over red 2005 Custom Steeda Mustang GT convertible from Garland, Texas. This was our featured Attitude Of The Week photo for 3/23/08. James Goode is a member of the North Texas Mustang Club, SVT of North Texas and The Black Mustang Club. In early May of 2006, James Goode walked into the entry way of Dallas Mustang with a plan. Goode wanted to make his 2005 Mustang GT convertible into a Steeda Mustang, but could not make the 1400 mile trip to Pompano Beach, Florida for the make over. Goode asked Randy Gibson, owner of Dallas Mustang to do the makeover. At that time, Dallas Mustang was able to build a Steeda Mustang. Justin, of Dallas Mustang started the makeover with Steeda Cold Air Kit, Steeda pulleys, Steeda Charge Motion Delete Plates, Steeda Headers with a Bassani X-pipe with hi/flo cats and a Corsa Exhaust, Steeda Strut Tower Brace, Steeda Sport Shifter, Steeda Sport Springs, Steeda Adjustable Panhard Bar and G-Trac Brace. With the SCT Xcalibrator 2 tune, the Steeda made over GT was pulling 302.11 RWHP and Max Torque of 316.64 lbs, an increase of 23 RWHP. These mods would most likely satisfy the average Mustang enthusiast. Goode wanted to add a little show to the Pony. He had Justin add billitt accessories to the interior and under the hood. Speaking of hood, Goode also had Justin add a Steeda 3-inch Heat Extractor Hood as well as a Steeda Chin Spoiler to his ride. Mike Testlin, owner of "Best in Show" paint & body in Garland, sprayed the pony in a custom black and silver over factory Torch Red color scheme designed by Kay Goode (the coach's wife). 70 year old James Crawford, venerable pin striper of 50 years added the finishing touches. Tim Morris of "Morris Custom Upholstery", Mesquite, Texas added a little sumpin-sumpin to the interior and trunk of Goode's Pony. Omar Medina of "Xtreme Audio" added a Panasonic head unit with 500 watt amp and 2 x 10" subs to the trunk. Omar also added a couple of 10" monitors in case Goode wanted to watch some game film while showing his ride. Paul Jordan of "Paul's Powdercoating" powder coated and, or chromed everything under the hood. On a sunny day with the hood up, you could get burned retinas! The old retired coach entered the North Texas Mustang Club's 17th Annual Yellow Rose All Ford Car Show in August of 2006 and immediately got hooked on showing his pony. To date the coach's car has won: 1st in class & Best Paint at the Yellow Rose 07; 1st in class & Best in Show at the AER Classic Car Show 07; Best Steeda, 1st in Class and Best in Show at the 07 Fun Ford Weekend. Goode also was introduced to Bentley Palez, owner of a highly polished and modified Black 05 Mustang GT convertible. They became good buds and often show their cars at major event together as the "Cruise Brothers" with another bud, Jim Bunch. Goode was very satisfied with his ride, until the winning of a Vortech Supercharger in a raffle at a charity car show caused a change in attitude. The mods by Dallas Mustang were now considered mild. When DM installed the Supercharger and did a retune, the mild pony became a "RADPONY"! The Dallas Mustang Steeda clone was now pulling 437.70 RWHP with 380.94 lbs of torque. The Pony could go fast, now it needed to stop fast. Goode had Justin to install a set of front & rear Baer 16" vented/cross drilled rotors with Baer Claw Calipers. Now this should satisfy the old coach, right? Not!! Goode knew he had two things going on in his life. 1) The old coach had surgery on his right foot coming up in November of 2007. 2) Goode wanted more power out of his pony. He wanted to take the RADPONY to the drag strip. He also knew taking a show car to the drag strip would be like taking a knife to a gun fight. The day before the surgery, Goode dropped the RADPONY off at Dallas Mustang and told Justin he wanted a stroker kit and forged rotating assembly added to RADPONY. The goal was 550 RWHP and 450 Torque. Goode knew he couldn't drive the 5-speed for at least 2-3 months. He told Justin to just take his time. Screaming Yellow 2005 Steeda Mustang GT coupe with Steeda front air dam, Steeda blacked out cowl hood with hood pins, fog lamps, Steeda 18 x 9.5 inch five spoke wheels, Steeda engine and handling modifications, and Steeda graphics.